This resource for educators and students of game theory aims to make lessons on game theory more relevant to the student (see also NSDL Scout Report for Math, Engineering, and Technology, October 11, 2002). 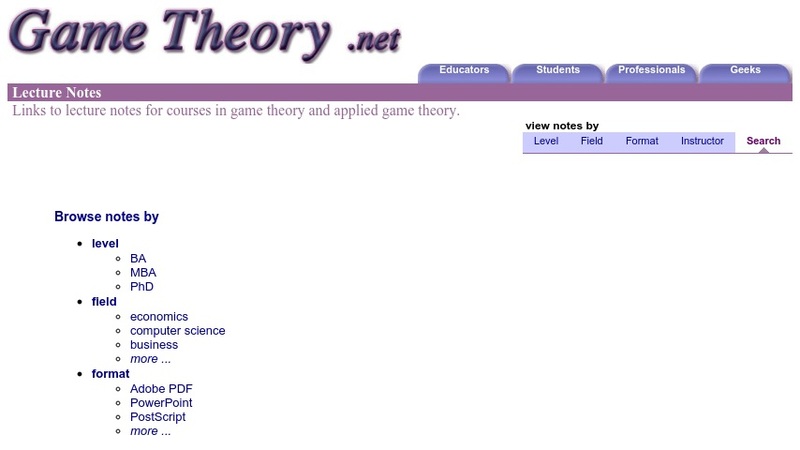 This section of the website provides links to lecture notes for courses in game theory and applied game theory offered by faculty at various universities. The collection is arranged in a table format and provides basic information on each entry as an overview, such as level of instruction, professor, course, institution, and special topics covered. Some of the special topics include finance, voting, and social learning.